Home > Shop By Brand > McKee's 37 Waxes, Compounds, Coatings > McKee's 37 Coating Prep Polish 128 oz. Polishes and preps paint for coatings, waxes and sealants - no IPA or paint strippers required! McKee's 37 Coating Prep Polish is the only polish specially formulated for application of permanent and semi-permanent paint coatings. By creating a polish that doesn’t have any oils, waxes, silicones, polymers or fillers, you can apply a paint coating immediately after polishing your paint with McKee's 37 Coating Prep Polish. There is no need to chemically strip the paint using isopropyl alcohol or volatile wax and oil removers. Paint coatings have quickly become one of the most popular forms of paint protection thanks to their ability to provide years of paint protection. For a paint coating to properly bond to the surface, the paint must be rid of gloss-hindering below-surface contaminants and imbedded dirt. While most polishes will successfully do this, they typically leave a wax, polymer, oil or some type of filler behind, all of which will prevent a coating from properly adhering to the surface. 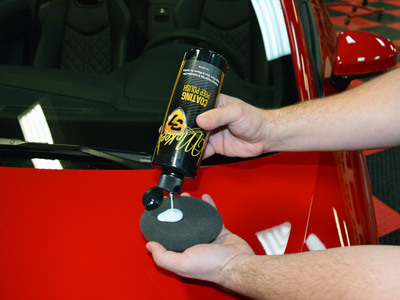 McKee's 37 Coating Prep Polish removes unwanted contaminants without leaving anything on the surface that will prevent a paint coating from properly bonding. McKee's 37 Coating Prep Polish is non-abrasive and safe for all paint systems. Formulated with an advanced blend of chemical cleaners, McKee's 37 Coating Prep Polish will make light colors appear brighter and dark colors appear wetter. McKee's 37 Coating Prep Polish will intensify the gloss of your paint by removing below-surface contaminants that hinder the shine. What’s more, McKee's 37 Coating Prep Polish will remove other topical contaminants including water spots, road film and light surface staining. McKee's 37 Coating Prep Polish can be applied by hand or machine. This versatile polish has been tested and proven to be compatible with all paint coatings. 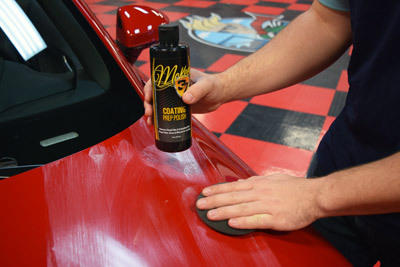 Like other products that bear the McKee's 37 name, Coating Prep Polish is exceptionally easy to apply and remove. Put an end to mixing up alcohol and spraying volatile cleaners on your paint and prepare it for a coating using McKee's 37 Coating Prep Polish. 2. Hand Application: Apply a dime-sized amount of product directly onto terry cloth or foam pad. Thoroughly work the product into the surface and remove residue with a microfiber towel. 3. Machine Application: Set polisher to a medium speed setting and apply a nickel-sized amount of product with a foam polishing pad. Thoroughly work the product into the surface and remove residue with a microfiber towel. After a full light polish, cleanser was applied with DA at low OPM. We did aprox 2'X2' sections 3 passes. Product handled well and wiped off easily. Seems to have worked well.